Ackee is a fruit in the soapberry family. 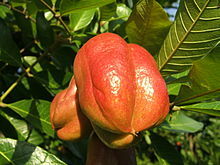 It is also known as achee, ackee apple or akee. The fruit is native to West Africa. Ackee was imported to Jamaica sometime before 1778. It is now the national fruit of Jamaica. It is most commonly served with salt fish. ↑ "Ackee". Jamaica Information Service. Retrieved 6 October 2016. This page was last changed on 6 October 2016, at 06:58.